Objective To evaluate the sustained remission and low disease activity after discontinuation of tocilizumab in patients with rheumatoid arthritis who were treated with tocilizumab alone or in combination with methotrexate. Methods The SURPRISE study was a 2-year, open-label randomised controlled study. Among patients who had been randomised to additional tocilizumab (ADD-ON) or switch to tocilizumab (SWITCH) in the first year, those who achieved remission based on the disease activity score for 28 joints (DAS28-ESR<2.6) discontinued tocilizumab at week 52 and were observed for the following 52 weeks. The endpoint of the second year included tocilizumab-free remission and low disease-activity rates, functional outcome, radiological outcomes assessed with the modified total Sharp score (mTSS) and safety. The efficacy of reinstituted tocilizumab/methotrexate was also evaluated. Results A total of 105 patients who achieved remission at week 52 discontinued tocilizumab; 51 in ADD-ON continued methotrexate and 54 in SWITCH received no disease-modifying antirheumatic drugs. Sustained DAS28 low disease-activity rates were significantly higher in ADD-ON than in SWITCH (55%vs27%, p=0.005). Sustained remission rates at week 104 were 24% for ADD-ON and 14% for SWITCH (p=0.29). Radiological progression was comparable between both groups (mTSS; 0.37vs0.64, p=0.36). The restart of tocilizumab induced remission in all except two patients after 36 weeks, irrespective of concomitant methotrexate. Conclusion Sustained low disease activity after tocilizumab discontinuation could be maintained with continued methotrexate in more than half of the patients. Retreatment with tocilizumab led to remission in more than 90% of patients. Trial registration number NCT01120366; Results. Tocilizumab, a humanised antihuman interleukin-6 receptor monoclonal antibody, has been validated to be efficacious in combination with methotrexate and as a monotherapy.22–25 Compared with TNF inhibitors, little is known regarding tocilizumab-free remission or low disease activity. The DREAM and ACT-RAY studies showed that only a small portion of patients remained in remission after discontinuing tocilizumab without concomitant conventional synthetic disease-modifying antirheumatic drugs (csDMARDs).16 17 Both studies, however, evaluated drug-free remission. One single-arm study reported that, in less than half of patients, remission was maintained after discontinuation of tocilizumab with sustained methotrexate18; however, no study has compared tocilizumab-free remission and low disease activity between with and without methotrexate. The SURPRISE study was a 2-year, open-label, randomised clinical study in which the efficacy and safety profile of adding tocilizumab to methotrexate (ADD-ON) or switching from methotrexate to tocilizumab (SWITCH) were evaluated in patients with active rheumatoid arthritis despite methotrexate treatment.26 In this study, tocilizumab was discontinued in patients in remission at week 52; therefore, patients in the ADD-ON continued methotrexate and those in the SWITCH were observed without DMARDs through week 104. This article reports the results of the second year. The SURPRISE study was a 2-year, open-label, randomised controlled study conducted at 30 institutes in Japan. In the first year, efficacy and safety were compared between the ADD-ON and SWITCH strategies, and the results have been already published.26 The current report covers the results of the second year in which tocilizumab-free rates were evaluated after discontinuing tocilizumab with or without methotrexate. The eligibility criteria for this study have been previously described.26 Briefly, the study included methotrexate and biologic-agents-naïve patients with rheumatoid arthritis according to the 1987 American College of Rheumatology classification criteria whose disease activity score for 28-joints based on erythrocyte sedimentation rate (DAS28-ESR) exceeded 3.2 despite methotrexate treatment. This report covers the planned analysis of the second year of the SURPRISE study (NCT01120366). This study was approved by the ethics committee at each site and conducted in accordance with the Declaration of Helsinki. All participants gave their written informed consent before inclusion into the study. Two hundred and twenty-six patients were randomly assigned at baseline to the ADD-ON or the SWITCH treatments. 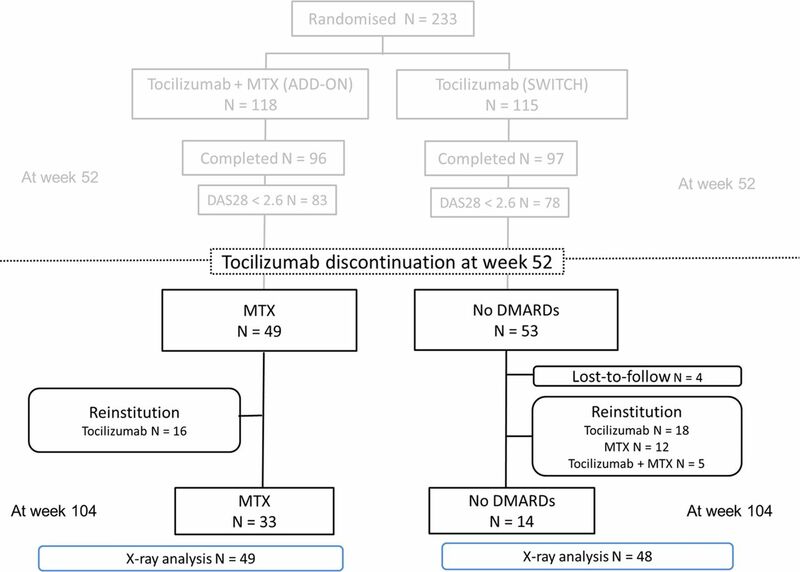 Tocilizumab at a dose of 8 mg/kg every 4 weeks was discontinued in patients in remission (DAS28 <2.6) at week 52; patients in the ADD-ON group continued methotrexate and those in the SWITCH group received no DMARDs. Glucocorticoids and non-steroidal anti-inflammatory drug use were not prohibited. At the investigator’s discretion, patients who experienced flare were administered intravenous tocilizumab at the same dose and interval in the ADD-ON group, while methotrexate and/or tocilizumab were administered in the SWITCH group. The treatment status was collected throughout the second year. The following parameters were assessed every 3 months: tender joint count, swollen joint count, Health Assessment Questionnaire Disability Index (HAQ-DI), patient global assessment using a visual analogue scale (VAS), evaluator global assessment using VAS, C reactive protein, erythrocyte sedimentation rate, rheumatoid factor (RF) and matrix metalloproteinase-3 (MMP-3). Radiographs of the hands and feet were obtained at week 104 in addition to those at weeks 0 and 52 from the first year. Each radiograph was assessed with the van der Heijde-modified total Sharp scoring system (mTSS) by two independent readers who were blinded to the patients’ clinical status and treatment. At each visit, patients were monitored for physical signs, laboratory parameters and adverse events. The primary endpoint of the second year of this study was tocilizumab-free rate and time. The tocilizumab-free rates included patients who had more than low disease activity as long as they did not receive tocilizumab. Secondary endpoints included rates and time of tocilizumab-free remission or low disease activity, change in DAS28-ESR, radiographic progression and rates of remission achievement after the restart of treatment. The restart of tocilizumab and/or methotrexate was deemed as a failure of tocilizumab-free. Four patients in the SWITCH group were started on re-treatment when their DAS28-ESR was still less than 2.6; methotrexate in three patients and tocilizumab in one patient. Their disease activity increased from DAS28 <1.8 when tocilizumab was discontinued to >2.4 when re-treatment was started; therefore, we regarded those patients to have failed to maintain tocilizumab-free remission. Time-to-events was analysed using the Kaplan-Meier method, and comparisons between the two groups were performed using the log-rank test. Patients who were lost to follow-up were regarded as censored. All analyses of proportions for treatment differences were performed with the χ2 test. The Clopper Pearson method was used to calculate the 95% CIs of proportions. Continuous variables were compared with Student’s t-test for two groups and with one-way analysis of variance for three groups. Efficacy analyses were conducted in the full-analysis population with the last-observation-carried-forward method. Safety endpoints including the incidence of adverse events, serious adverse events, infections and specific laboratory abnormalities were analysed in all treated patients. P values of less than 0.05 were regarded as statistically significant. shows the study flowchart through the 104 weeks. Among 83 patients in the ADD-ON group and 78 in the SWITCH group who achieved remission at week 52, 49 in the ADD-ON group and 53 in the SWITCH group agreed to discontinue tocilizumab. The 59 patients who refused to stop tocilizumab were excluded from the analyses. Therefore, a total of 102 patients (49 who continued with a mean dose of 7.7 mg/week of methotrexate and 53 who received no DMARDs) were analysed for efficacy and safety as the full-analysis population in the second year of the SURPRISE study. No difference was found in disease activity at week 52 between patients who stopped tocilizumab per protocol and those who did not (DAS28 was 1.5 in the former and 1.6 in the latter, p=0.33). Five patients in the SWITCH group lacked radiographs of the hands and feet and were excluded from the radiographic analysis. Study flow chart. DAS28, disease activity score for 28 joints; DMARD, disease-modifying antirheumatic drug; MTX, methotrexate. There were no statistically or clinically significant differences in characteristics between the two groups at tocilizumab discontinuation (table 1). Eight patients (15.1%) in the SWITCH group and 5 (10.2%) in the ADD-ON group received glucocorticoids with a mean dose of 3.4 mg/day and 2.4 mg/day, respectively. The tocilizumab-free rates are shown in figure 2A. Four patients in the SWITCH group were lost to follow-up and were regarded as censored. The rates of patients who remained tocilizumab-free were significantly higher in the ADD-ON group than in the SWITCH group; 67.3% (95% CI 54.0% to 80.6%) vs 28.5% (95% CI 16.4% to 40.6%) at week 104, p<0.001, respectively (p<0.001). Whereas tocilizumab-free remission rates were not significantly different between the ADD-ON and SWITCH groups (24.4% (95% CI 12.4% to 36.5%) vs 14.3% (95% CI 4.6% to 24.0%) at week 104, p=0.29, figure 2B), tocilizumab-free low disease-activity rates were higher in the ADD-ON group (55.1% (95% CI 41.1% to 69.1%) vs 26.6% (95% CI 14.5% to 38.7%) at week 104, p=0.005, figure 2C). Tocilizumab-free rates. The restart of tocilizumab and/or methotrexate was deemed as a failure of tocilizumab-free remission if the drugs were restarted when the patients were still in remission or with low disease activity. (A) Overall tocilizumab-free rates, (B) tocilizumab-free remission rates, (C) tocilizumab-free low disease-activity rates. *P<0.05. If we regarded the restart of methotrexate alone in the SWITCH group as being tocilizumab-free, the difference between the ADD-ON and SWITCH groups became non-significant (67.3% vs 53.1%, p=0.22; online supplementary figure 1). However, the favour of continuing methotrexate at tocilizumab discontinuation still could be seen. Probability plots of changes in mTSS from week 52 to week 104 showed slightly more radiological progression in the SWITCH group than in the ADD-ON group (figure 3A); however, the mean change in mTSS was comparable (0.37 in the ADD-ON group and 0.64 in the SWITCH group, p=0.36, figure 3B). The rates of non-progression or rapid progression (changes in mTSS ≤0, ≤0.5, ≥3 or ≥5) were also not different between the two groups (figure 3B). When we looked at changes in mTSS from week 0 to week 52, the mean change was 0.57 in the ADD-ON group and 0.77 in the SWITCH group (p=0.36; online supplementary figure 2A and 2B). As a whole, the non-progression rates were modestly better in the second year than in the first year. Structural outcome. (A) Cumulative probability plot of change from week 52 to week 104 in mTSS. (B) Mean change in mTSS and the percentage of patients with change in mTSS ≤0, ≤0.5, ≥3 or ≥3. mTSS, van der Heijde-modified total Sharp score. HAQ-DI was 0.25 in the ADD-ON group and 0.29 in the SWITCH group at tocilizumab discontinuation (p=0.59), and were 0.30 and 0.17, respectively, at week 104 (p=0.29). The comparison of characteristics at tocilizumab discontinuation between patients who achieved tocilizumab-free remission or low disease activity and those who did not revealed that patients who achieved tocilizumab-free remission showed less RF positivity, lower patient global assessment and lower MMP-3. Patients who achieved tocilizumab-free low disease activity used methotrexate more frequently, showed less RF positivity and had a lower patient global assessment (online supplementary table 1). Taken together, RF negativity and lower patient global assessment may be predictors for successful tocilizumab-free achievement. Tocilizumab was added to methotrexate in 16 patients of 49 (32.7%) in the ADD-ON group because of flare between weeks 52 and 104. In the SWITCH group, 35 of 53 (66.0%) restarted medication: methotrexate (n=12), tocilizumab (n=18) or a combination of both (n=5). The median duration from tocilizumab discontinuation to treatment restart was 16 weeks in the ADD-ON group and 14, 16 and 8 weeks in the SWITCH group with methotrexate, tocilizumab and methotrexate plus tocilizumab, respectively. Online supplementary table 2 shows the characteristics of the ADD-ON and SWITCH groups at retreatment. Figure 4A shows the DAS28 remission rates at treatment restart and after 12, 24 and 36 weeks in both groups. All but one patient in the ADD-ON group (85.7%) and 79.2% of patients in the SWITCH group achieved remission again at week 36 (p=0.14). In the SWITCH group, 11 of 12 patients (92%) who were treated with tocilizumab alone and all patients treated with tocilizumab concomitant with methotrexate achieved remission at week 36, while remission was achieved in 50% of patients who received methotrexate alone (p=0.03, figure 4B). Overall, the restart of tocilizumab induced remission in 91.3% of patients and its efficacy was independent of concomitant methotrexate. 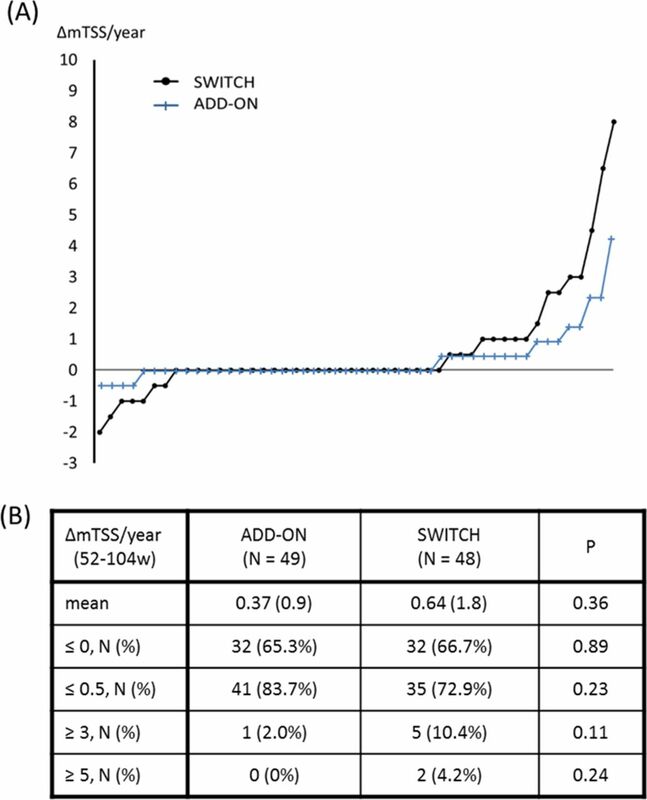 Percentage of patients who achieved DAS28 remission after treatment was restarted (A) in the ADD-ON and SWITCH from the restart through 36 weeks, and (B) in the ADD-ON and the three SWITCH groups (re-treatment with methotrexate (MTX), tocilizumab (TCZ) or tocilizumab plus methotrexate) at week 36. DAS28, disease activity score for 28 joints. *P<0.05. The safety results at week 52 through week 104 are presented in table 2. The number of patients with adverse events tended to be higher in the ADD-ON group than in the SWITCH group. The most frequent adverse event in the ADD-ON group was gastrointestinal disorder including oral ulcer and abdominal pain. Two serious adverse events were observed in the ADD-ON group (one gastric cancer without the restart of tocilizumab and one pneumocystis pneumonitis after the restart of tocilizumab), while none were noted in the SWITCH group. The findings of the second-year results of the SURPRISE study showed that maintained remission after tocilizumab discontinuation was similarly low with or without methotrexate in patients with rheumatoid arthritis who had been in remission, while continued methotrexate could double the chance of sustained low disease activity compared with no DMARDs. The reinstitution of tocilizumab achieved remission in more than 90% of patients, with or without methotrexate. Radiological progression was modestly lower in the ADD-ON group than in the SWITCH group, although the mean changes in mTSS per year were very low, with no significant difference between both groups. Functional impairment also did not change in the second year in either group. Although retreatment with tocilizumab and/or methotrexate might have affected those results, our study suggests that stopping tocilizumab after remission achievement is worth attempting, in that retaining methotrexate is better for maintaining low disease activity. In addition, those results could re-emphasise the results of the first year of the SURPRISE study; tocilizumab induction would be recommended in combination with methotrexate in patients inadequately responsive but tolerant to methotrexate. However, it should be noted that continued methotrexate caused more adverse events, especially gastrointestinal symptoms, which was a definite drawback of the non-DMARDs-free strategy. The optimal dose of continued methotrexate is another issue that requires clarification. The reinstitution of tocilizumab was as efficacious as the initial administration. This is in line with the results of the RESTORE study in which 89% of patients achieved DAS28 remission within 12 weeks of retreatment with tocilizumab,27 and those of the RONIN study in which all of four patients responded to tocilizumab retreatment after long-term discontinuation of tocilizumab.19 While the results of the first year of the SURPRISE study showed that tocilizumab with concomitant methotrexate induced remission earlier than tocilizumab without methotrexate, the reinstitution of tocilizumab was comparably effective, with and without methotrexate. This could be attributed to disease activity at tocilizumab initiation. A study reported that the concomitant use of methotrexate and tocilizumab was more important in patients whose DAS28 exceeded 5.1 than in those with less activity.28 Indeed, the mean DAS28-ESR at baseline in the SURPRISE study was approximately 5.1 to 5.3 but was 4.1 to 4.4 at tocilizumab reinstitution. Methotrexate led to remission in half of the patients despite the inclusion criterion in this study of an inadequate response to methotrexate. This may also be due to different disease activities at the start of methotrexate administration. The good results shown by reinstituted tocilizumab in patients with flare-up after discontinuation of tocilizumab can also support the strategy of tocilizumab suspension in clinical, economic and safety aspects. Our study has some limitations. First, this was an open-label study with a limited number of subjects. Both patients and rheumatologists were aware whether patients were receiving methotrexate or not, which could have affected the assessment. Second, the lack of anticitrullinated antibody and the small sample size hampered the solid identification of predictive factors for successful tocilizumab-free remission or low disease activity. Third, we did not have information regarding patients who did not stop tocilizumab after 52 weeks; therefore, a comparison of patients who stopped tocilizumab and those who continued was not performed. Fourth, the inclusion criterion for the second year of the SURPRISE study was a DAS28 <2.6 at a single time point of week 52. However, a sustained remission status has recently been considered to raise the feasibility of DMARDs tapering.29 Fifth, we did not examine methotrexate-free remission or low disease-activity rates with continued tocilizumab, which is another strategy of treatment reduction that should be investigated in the future. Nevertheless, the results of the second year of the SURPRISE study provided valuable insights into the possibility of stopping tocilizumab after achieving remission. In conclusion, the results of the second year of the SURPRISE study show that the discontinuation of tocilizumab after remission achievement is feasible for maintaining low disease activity with continued methotrexate. The restart of tocilizumab is efficacious for suppressing flares, with or without methotrexate. The authors acknowledge and thank all the investigators and participants in this study.
. EULAR recommendations for the management of rheumatoid arthritis with synthetic and biological disease-modifying antirheumatic drugs: 2016 update. Ann Rheum Dis 2017.
. Withdrawal of adalimumab in early rheumatoid arthritis patients who attained stable low disease activity with adalimumab plus methotrexate: results of a phase 4, double-blind, placebo-controlled study [abstract]. Arthritis Rheum 2011;63:665–6. Contributors YK, NM, HY, KY and TT designed the study and analysed and interpreted the data. YK, MK, YT, MI, HK-H, KA, MM and YM were involved in collecting data and managing their clinical research sites. YK, HY, SH and ET scored mTSS blinded to patients’ clinical information. All authors were involved in writing the manuscript and approved the final version. Funding This study was supported by Specified Nonprofit Corporation Advanced Clinical Research Organization. Competing interests YK has received grants or speaking fees from from AbbVie, Astellas, Ayumi, Bristol-Myers Squibb, Chugai, Eisai, Eli Lilly, Hisamitsu, Jansen, Kissei, Pfizer, Sanofi, Takeda, Tanabe-Mitsubishi and UCB. MK has received research grants or lecture fees from GlaxoSmithKline K.K. and Actelion Pharmaceuticals. YT has received grants or speaking fees from Mitsubishi-Tanabe, Takeda, Bristol-Myers, Chugai, Astellas, AbbVie, MSD, Eli Lilly, YL Biologics, Daiichi-Sankyo, Sanofi, Janssen, Pfizer, Kyowa-Kirin, Eisai and Ono. HK-H has received speaking fees from Chugai, Astellas and Bristol-Myers Squibb. KA has received research grants from Chugai Pharmaceutical Co. and speaking fees from Daiichi-Sankyo, Eli Lilly, Pfizer Japan and Tanabe-Mitsubishi. MM is an employee of the Japanese Red Cross Society. YM has received grants, instructor fees or speaking fees from Chugai, Ono, Daiichi-Sankyo, Teijin, Eisai, Nippon Kayaku, Tanabe-Mitsubishi, Kissei, Janssen, Eisai, Astellas, Ayumi, Takeda, UCB, Sanofi and Eli- Lilly. HY has received grants or speaking fees from Bristol-Myers Squibb, Takeda, Japan Blood Products Organization, Eizai, Daiichi-Sankyo, Novartis, Chugai and Actelion. SH has received grants, lecture fees or speaking fees from AbbVie, Astellas, Ayumi, Bristol-Myers Squibb, Chugai, Eisai, Eli Lilly, Jansen, Kissei, Pfizer, Sanofi, Takeda, Tanabe-Mitsubishi and UCB. ET received speaking fees from AbbVie, Ayumi Pharmaceutical, Bristol-Myers Squibb, Chugai Pharmaceutical, Eisai Pharmaceutical, Nippon Kayaku, Pfizer, Takeda Pharmaceutical and UCB Pharma. HY has received research grants, consultant fees or speaking fees from MSD, Astellas, AbbVie, Bristol-Myers Squibb, Kaken, UCB, Ono, Ayumi, Eisai, Daiichi-Sankyo, Takeda, Tanabe-Mitsubishi, Chugai, Teijin, Torii, Nipponshinyaku, Pfizer, YL Biologics and Nipponkayaku. KY has received grants or speaking fees from Astellas Pharmaceutical, Chugai Pharmaceutical, Eizai Pharmaceutical, Immunofuture Inc, Mitsubishi Tanabe Pharma Corporation, Santen Pharmaceutical, Pfizer Japan Inc, AbbVie GK, Bristol–Myers KK, Diaichi Sankyo, Eli Lilly, Sanofi, Janssen and UCB. TT has received research grants or speaking fees from Astellas Pharma Inc, Bristol–Myers K.K., Chugai Pharmaceutical Co, Ltd, Daiichi Sankyo Co, Ltd, Takeda Pharmaceutical Co, Ltd, Teijin Pharma Ltd, AbbVie GK, Asahikasei Pharma Corp, Mitsubishi Tanabe Pharma, Astra Zeneca KK, Eli Lilly Japan KK, Novartis Pharma KK, AbbVie GK, Nipponkayaku Co, Ltd, Janssen, Pharmaceutical KK, Taiho Pharmaceutical Co, Ltd and Pfizer Japan Inc. MI and NM have nothing to declare. Ethics approval The ethics committee at each site. Collaborators Other investigators of the SURPRISE study group: Takao Fujii (Kyoto University), Atsushi Kawakami (Nagasaki University Graduate School of Biomedical Sciences), Hideshi Yamazaki (Marunouchi Hospital), Yasuaki Okuda (Dohgo Spa Hospital), Kazuhide Tanimura (Hokkaido Medical Center for Rheumatic Diseases), Atsushi Kaneko (Nagoya Medical Center), Toshio Tanaka (Osaka University), Akira Murasawa (Niigata Rheumatic Center), Kazuhiko Ezawa (Kurashiki Sweet Hospital), Yukitaka Ueki (Sasebo Chuo Hospital), Yoshiki Shiohira (Yuuaikai Tomishiro Central Hospital), Hiroaki Dobashi (Kagawa University), Naoki Kondo (Niigata University Graduate School of Medical and Dental Sciences), Toshihiko Hidaka (Zenjinkai Shimin-no-Mori Hospital), Hajime Sano (Hyogo College of Medicine), Mitsuhiro Iwahasi (Higashi Hiroshima Memorial Hospital), Motohiro Oribe (Oribe Clinic of Rheumatism and Medicine), Shohei Nagaoka (Yokohama Minami Kyosai Hospital) and Kensei Tsuzaka (Tokyo Dental College Ichikawa General Hospital).